Grand Canyon From Point Imperial, Grand Canyon National Park, Arizona, copyright 1964 Philip Hyde. Primary publicity photograph for This Land Is Our Land Exhibit. Philip Hyde (1921-2006) dedicated his life to photographing and defending the western American wilderness, working with the National Audubon Society, Wilderness Society, Sierra Club, and other environmental organizations during a career that lasted more than 60 years. His studies at the California School of Fine Arts under Ansel Adams and Minor White gave him an introduction to the technical expertise and aesthetic sensitivity necessary to later make some of America’s most respected landscape photographs, many of which were key elements in campaigns to protect the Grand Canyon, Point Reyes, California coastal redwoods, North Cascades National Park, and other sensitive lands. Hyde was born and raised in San Francisco. In 1938, he visited the Sierra Nevada for the first time on a Boy Scout backpacking trip and took his first photographs with a Kodak camera he borrowed from his sister. He borrowed the camera to photograph his friends, but he found that he pointed his lens more often at the natural wonders around him. By the early 1940s, he spent most of each summer with his camera in the backcountry of Yosemite and other national parks. One of Hyde’s strongest collaborations was with the Sierra Club. 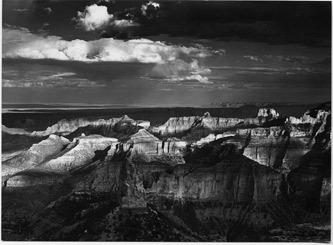 Hyde began to photograph for the organization in 1950 when he became the official photographer for the summer Sierra Club High Trip with David Brower. Soon afterward, Hyde became the first photographer ever sent on assignment for an environmental cause when Brower sent him to Dinosaur National Monument to photograph canyons threatened by two proposed dams. Brower called Hyde his “go-to photographer,” because when the Sierra Club needed to explore and display an area’s natural attributes, Brower sent Hyde to capture them on film. Hyde was one of the main illustrators of the Sierra Club Exhibit Format Series, conceived of by Adams, Nancy Newhall, and Brower. The Sierra Club books were the public face of the environmental movement. Color photography became an important feature of the series when Hyde and Eliot Porter began to produce color photographs and envision their projects in color. They established color landscape photography as an art in its own right. Hyde’s color scenes inspired a generation of photographers, both directly and indirectly, and his techniques are still evident in current landscape photography. Hyde continued to tirelessly capture America’s unspoiled and endangered lands for decades, averaging 100 days a year in the field for nearly 60 years. He stopped making photographs only after he lost his sight toward the end of his life. Hyde’s work has appeared in more than 80 books and over 100 other publications, including Aperture, New York Times, Life, National Geographic, Fortune, and Newsweek. Hyde received many awards and honors throughout his career, and in 1996, the North American Nature Photography Association honored Hyde with a lifetime achievement award. His work has been shown in major museums and galleries throughout the nation, including the Smithsonian Institution and Metropolitan Museum of Art. Smith Andersen North is pleased to announce that David Leland Hyde, Philip’s son, will speak at our reception on January 25. David is an accomplished photographer in his own right and an enthusiastic supporter of his father’s legacy. January 25 – March 1, 2014. Previous Entry: Smith Andersen North Gallery Representing Philip Hyde At Photo L. A. Happy to see how successful the exhibit turned out with a size -able crowd and fine pictures. I really like P. Hyde’s aspen image. Also, glad to see how much you’ve developed as a photographer. Good luck with your future projects. They sound exciting & hold much promise. You deserve continued success with your hard work, perseverance and talent. Hi Aileen, Thank you for the comment. By the time it was over Stefan estimated over 250 people showed up, more than any other show since the Golden Decade exhibit four years ago. I also appreciate you noticing my photography. Best to you as well. Glad you made it to the big show. Previous Entry Smith Andersen North Gallery Representing Philip Hyde At Photo L. A.